What is not to love about spring? The fresh air. The reappearance of robins. The disappearing snow. The longer hours of daylight. The emergence of flowers. And that first hot, sweaty run of the season! I run outside, all year long. In the hot, humid summer. In the cool, crisp autumn. In the frigid, snow-covered winter. But my absolute favorite season is spring. 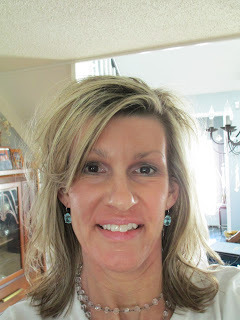 Even though I am outside all winter long, I feel like a butterfly emerging from a cocoon in the spring. Suddenly, the air smells fresher (well, MOST days it does....I live in Iowa, and some days that fresh air is not so fresh, especially when the area farmers are fertilizing their fields). The trees gradually provide more shade as the leaves begin budding. The white show is replaced periodically with mud, then the grass turns green and the flowers slowly begin to bloom. 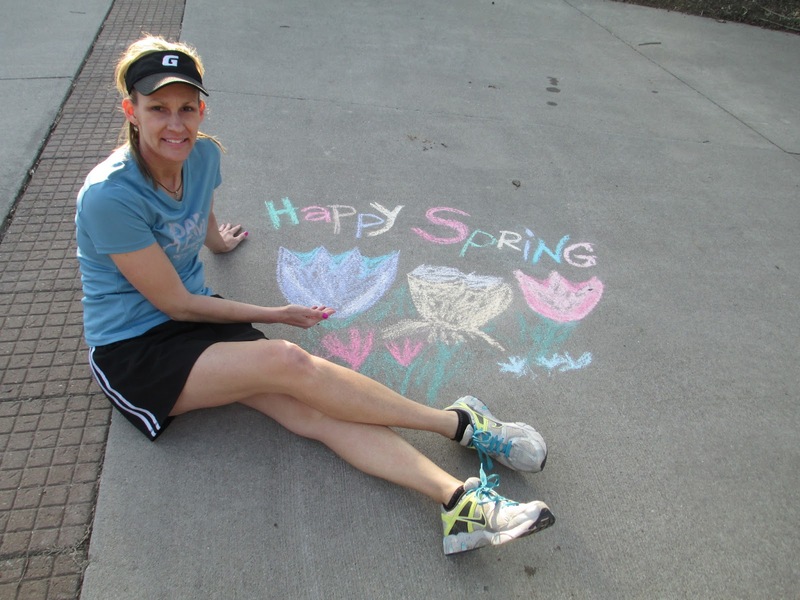 As a runner, I especially love the warmer temps. It's liberating going from multiple layers (tights, skirt/shorts, Under Armour top(s), puffer vest, head band and gloves) to the bare minimum. Sometimes it's a slow progression....running without the vest or gloves, then losing the tights, shedding the long-sleeved top. Other times, like today, it was kind of sudden. I ran with a tank top under a short-sleeved tech top and a skirt and I was a sweaty mess when I returned home. And it's all good! I get annoyed with the extreme temps in Iowa. It's very hot and humid in the summer, and artic-like freezing cold in the winter. The autumn and spring are certainly the most ideal temps for running. But I live here, 24/7. And if I sat around and whined every time there wasn't "perfect" running weather, I'd be pretty miserable. Actually, I think having the change of seasons and extreme weather gives me an advantage It's made very adaptable. I'm not super fast or competitive, but I enjoy racing. And races happen in every kind of weather (except when there's lightening). 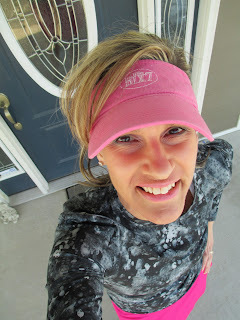 I once ran a 20K (12.4 miles), and the first 9 miles were in the rain. Two months later, I ran another race, a 7-mile race that was entirely one hill after another, and that race also was in the rain. I ran two different "jingle bell" themed races this past December, and both of those also had rain (December rain is much colder than July rain, just saying). Sometimes the only option is putting one foot in front of the other until you cross the finish line. So, it is spring, and I am ready for it! And, I look forward to heat of summer in a few months, too. How about you? 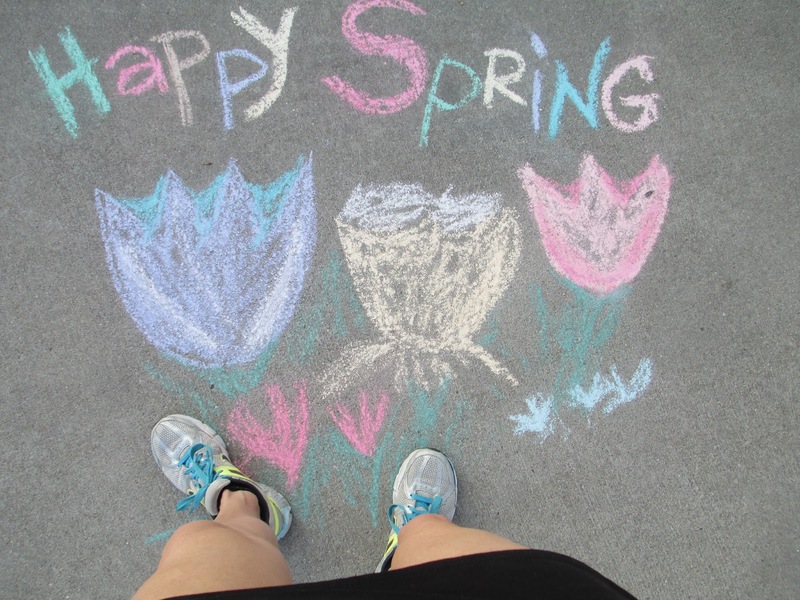 Do you run outside year-round? Another birthday has come and gone, and I finally have a few minutes to reflect upon (and blog about) it. My birthday is (and has always been) on March 14th. It's a day I usually look forward to, and don't dread the "another year older" stigma. Inrecent years, though, it has been called "Day of Pi." Hmmmm. I was a bit of a math geek in my younger years, and it never occurred to me to think of March 14th as Pi Day. It makes sense...March is the 3rd month in the calender year, and the 14th day is special (to me and anyone else who has had the fortune of making their appearance on this day), and the numeric for Pi is 3.14. Funny how I never made that correlation. My day started out great, in other words: the hair cooperated and looked better than most days. The husband left me a nice card. I took two pans of brownies to work to share with the co-workers, and was pleasantly surprised to see a bunch of beautifully-frosted cupcakes waiting for me. Another co-worker had made a sweet card with a picture of a race medal on it (she knows I like my racing hardware). Yet another co-worker started singing the "Happy Birthday" song to me. And then I noticed something simply grand.....somehow, Jon Bon Jovi had gotten in the building and left several autographed photos on my desk. He'd written a few sappy sentiments on them, too (that I won't publish on here). 85 greetings on Facebook from various friends, family and acquaintances. The weather was most grand, around 50 degrees, which is warm for March in Iowa. It was perfect for a run outside in the sunshine. 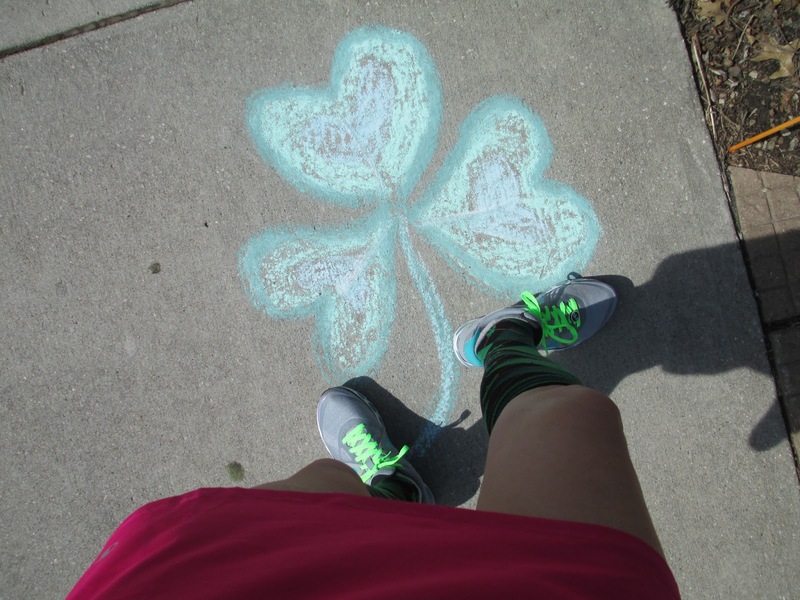 In celebration of Pi, I ran the obligatory 3.14 miles. Later, we had dinner at one of our local Mexican restaurants. Of course, there was the mandatory feliz cumplianos celebration, complete with the celebrant (myself) modeling a sombrero the size of our table (Sorry, those pics are private, LOL) I don't embarrass easily, so it was more fun than anything. My parents were there, as well as the husband, our son and the oldest daughter (home from college, a day early for spring break!). The younger daughter didn't join us for dinner because she had dance class. 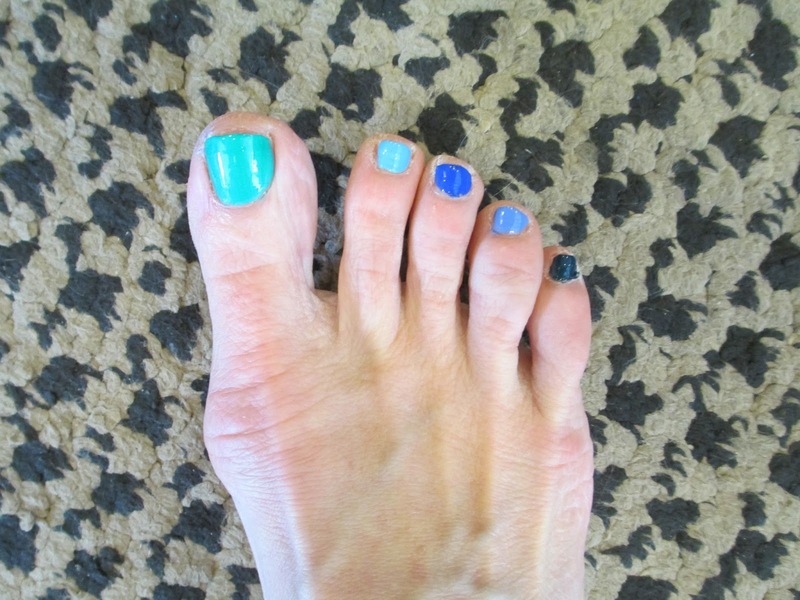 She is my resident manicurist, though, and had given me a fancy pedicure the evening prior. 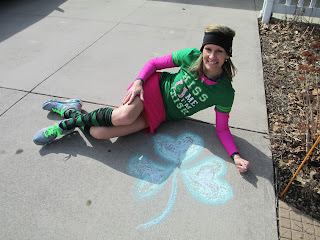 What most don't know about my birthday is that I was supposed to arrive on St. Patrick's Day. Apparently, I did not want to share that grand day with all of Ireland, so I made my appearance 3 days early. None the less, I have always felt some degree of loyalty to St. Patrick, and enjoy celebrating his day (though I have zero Irish heritage in my gene pool). 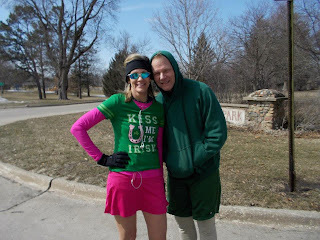 This year, myself, the husband, and a few others gathered together and ran in St. Patrick's honor. 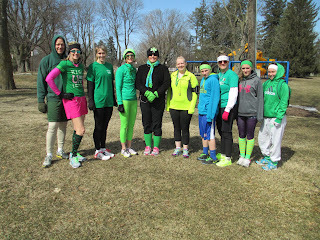 It was nothing grand, but we had plenty of sunshine and the company of fellow runners, all dressed in green. And, for the first time ever in my running career, I did a warm-up run prior to the actual run with the gang. I have seen "elite" runners do this at events, and I never understood the significance of using all that energy BEFORE the race itself. But I was advised to do a warm-up at an easy pace, and it would actually enhance my performance at the start line. And, guess what! It worked! I violated my comfort zone and it paid off. Planking & Push-ups & Pancakes (? ), Oh MY!!!! With the current Daily Plank & Push-up challenge happening on my Facebook page, Running on the Fly, I thought it might be time to bring in a few pointers and humor to recharge everyone. First of all, why have a challenge to begin with? A challenge is meant to be a temporary event, kind of like a mini contest. It is meant solely to give the participants a chance to violate their comfort zones and try something they either have never done before, or do something even more grand than they normally would be comfortable doing. What happens for most people, is they discover the challenge wasn't as bad as they feared. Quite often, they learn they have more power and discipline than they were aware of. Ideally, they will tap into this new found power and utilize it in future events, workouts or on a daily basis. We have been challenged to do planks and push-ups. Daily. Guess what? Most of us do not love them, myself included. I do, however, LOVE what they have done for my body. 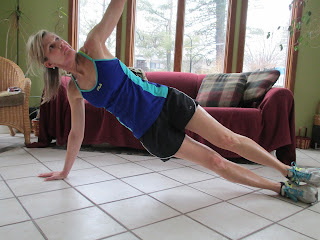 These are two exercises that will strengthen your core, which, in turn, will aid in your performance as a runner. (And they will help build arm muscles and tone up your abs.....and who doesn't want stronger arms and flatter tummies?). Having a strong core will also improve your posture (which will also make you look slimmer). A solid core gives you strength in running (as well as most other activities) because it helps with your balance and stability. You use your arms to pump as you run, but your core also aids in this process as you slightly twist with each stride. If you have a strong core, your arms don't have to do "as much" of the work on their own, thus, the entire "running effort" is made easier. (As I have said in prior blog entries, I am not an exercise scientist, I am simply repeating information that I have seen). So, how does one "plank?" There are a couple different methods. If you are a beginner, the easiest position is the hands/feet position. 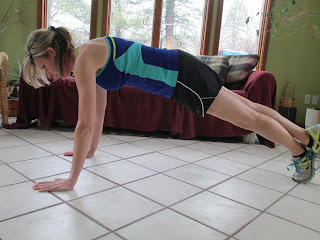 Basically, this is the push-up stance, without doing the push-ups. You are on your toes and hands (facing the floor)....and you hold that position as long as possible. The more traditional position is similar, but you are on your elbows instead of your hands. This is more challenging, but the reward is it will work your abs a little more effectively in less time. There is also the side plank, where you are on you side, have your feet "locked together" (or the top foot resting on the bottom leg's calf). 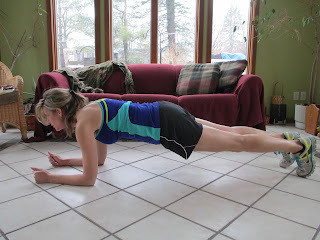 They key to success with planks is to hold everything "in" as tight as you can for as long as possible....flex the thigh muscles, squeeze the buttocks and hold in the tummy. Now, for the push-ups. 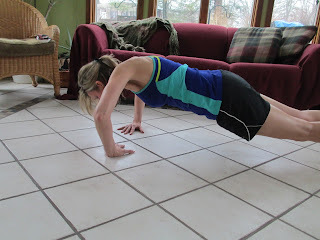 There are many ways to do push-ups. You can have your hands directly below your shoulders, wider than shoulder-width, hands pointing forward or inward, hands under your rib cage, etc. You can have your feet together or apart, or even stacked on top of each other. And, you have the option of doing push-ups on your knees if you're intimidated by doing them on your toes. The main thing is to just do them, and try to get as much range of motion as possible (going down as close to the ground as possible, but still being able to push yourself back up). 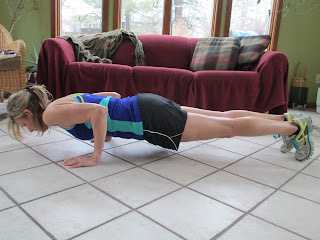 Planks and, especially, push-ups also utilize a lot of chest and shoulder strength. Most likely, you will feel some tenderness in your chest and shoulders the next day, but that will go away as you improve on your form. Also, try to keep your back as flat as possible....flat as a pancake!. If you can feel your back starting to sway or bend, you've probably done too much. Practice makes perfect, so get down on the floor! 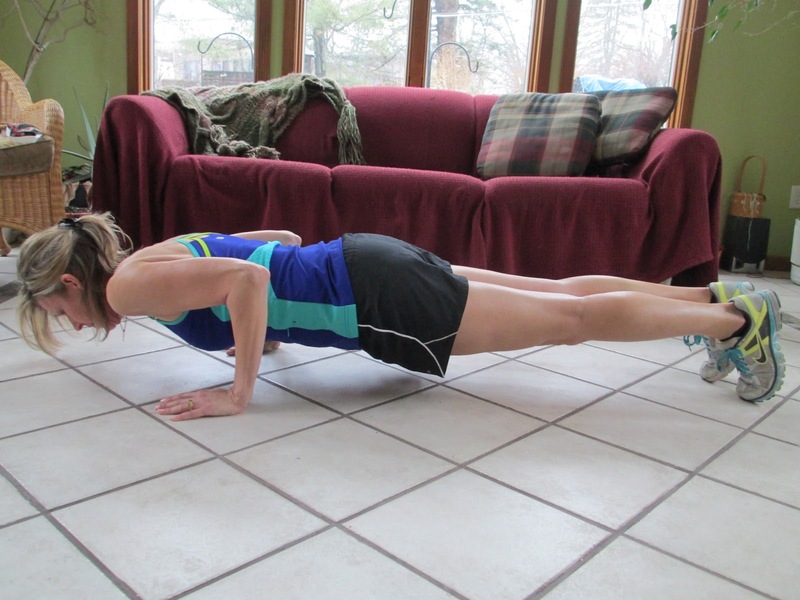 Do you have a love/hate relationship with planks and/or push-ups?